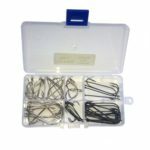 This selection contains sea fishing hooks in a range of sizes and patterns, covering all situations which will be encountered when fishing around the British Isles. There are seventy hooks included, in sizes ranging from 4 to 4/0. Supplied in a pocket-sized compact clip shut box. Cronus Baitholder Hooks are medium wire hooks with the additional barbs on the shank preventing baits – especially lugworm and ragworm – from sliding down the hook and covering the point. Sizes 1 and 1/0 are included in this set, an ideal size for targeting flatfish and smaller species. Angling Works Circle Hooks are also included with this set in size 1. Circle hooks are becoming increasingly popular all around the UK due to their self-hooking properties. When using circle hooks there is no need to strike in the traditional manner. Instead simply reel in normally and the hook will slide to the edge of the mouth of the fish where it will become firmly hooked. Circle hooks are ideal for anglers practicing catch and release fishing and look set to increase in popularity across the UK. Cronus Silver Aberdeen Hooks are slightly heavier gauge than black Aberdeen hooks, making them a good choice for targeting larger species such as bass, rays and cod. Size 4/0 hooks are included in this set. Cronus O’Shaughnessy are strong, heavy wire hooks which are designed for fishing for larger species such as conger eels and the biggest cod. They are included in this set in size 3/0. 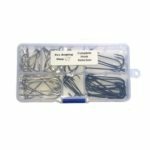 Cronus Black Aberdeen Hooks are relatively fine wire hooks which are designed for good bait presentation and general purpose fishing. Size 2/0 are included for all round fishing, and size 4 are supplied for anglers fishing the smaller species.